He followed me on Twitter, so I followed him. What caught my attention was that he had an intriguing book out, which we’ll cover shortly. Homer Bush was not a big MLB guy by today’s standards, 5’10”, 180-lbs, while spending 7 years in the Bigs. The thing that separated him from other ex-MLB guys, I follow on Twitter, was the growth mindset he showed in his book: Hitting Low in the Zone: A New Baseball Paradigm . Typically, Big League players don’t dive into Sabermetrics, as readily as they will in the coming years, so it was refreshing to see Homer Bush taking a hard look at ways hitters can exploit inefficiencies at the Big League level by spotting Metric patterns. Not only do his strategies work at the elite level, but do at the lower levels as well. Figure out how to hit with power to ALL fields. If you aren’t helping your hitters grow, then they’re dying. Homer Bush was selected by the San Diego Padres in the 7th round of the 1991 amateur draft. He went on to play 13 years of professional baseball. Homer also played for the New York Yankees, Toronto Blue Jays and the Florida Marlins. 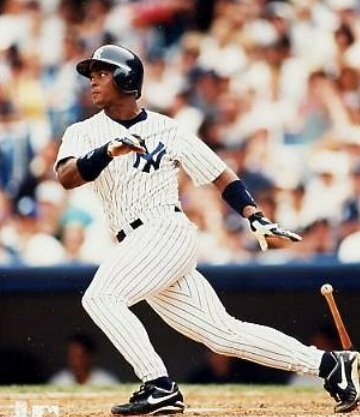 He was a member of the record setting 1998 Yankees World Series Championship team. He recently authored his first book called Hitting Low in the Zone: A New Baseball Paradigm . Homer is currently Director of Youth Programs for the Texas Rangers and lives in Southlake, Texas with his wife and 2 children. If you were to train me for four weeks for a HUGE tournament and had a million dollars on the line, what would the training look like? What if I trained for eight weeks? With 4 weeks of training, we’d spend 50% of the time working on proper hitting mechanics–grip & stance, load and swing path. We’d spend 25% of the time understanding the hitting zone, as opposed to the the strike zone. And the last 25% of the time, we’d work on your mental approach at the plate as far as focus and building on the positives, so that adjustments can be made from pitch to pitch. With the additional 4 weeks, we’d just build on these areas with emphasis on repetition. What makes you different? Who trained you or influenced you? My major league experience allowed me to see hitting at its highest level on a daily basis. When reflecting back, it is clear that all of the elite players that I played with or against were good low ball hitters. Some of my influences were… Tony Gwynn, Tim Raines, Derek Jeter, Bernie Williams, Chili Davis, Darryl Strawberry, too many to name them all. What are your favorite instructional books or resources on the subject? If people had to teach themselves, what would you suggest they use? The Physics of Baseball , by Robert K. Adair Ph.D.
Tanner Low Ball Custom Tee 16-23 inches (this isn’t a link to the custom tee, but maybe contacting Tanner Tee, and they may do one for you for an extra cost). What are the biggest mistakes and myths you see in hitting? What are the biggest wastes of time? That the swing is level. There is no such thing as swinging through the baseball. Rotating the back hip through the zone is necessary for power. Everyone has their own way of hitting. Every batter must have similarities in their mechanics at a certain point in the hitting process. ‘Squishing the Bug’ philosophy is a joke. In my opinion the biggest waste of time is hitting off of pitching machines in indoor academies because they are too erratic and almost impossible to time. Who is good at hitting despite being poorly built for it? Who’s good at this who shouldn’t be? Yadier Molina, average height, wide body and not very fast (not your idea baseball player build) but very productive at the plate. Who are the most controversial or unorthodox hitters? Why? What do you think of them? One of the most unorthodox hitters was my former teammate, Tony Batista— unusual, open batting stance but very effective with good power. Who are the most impressive lesser-known teachers? Have you trained others to do this? Have they replicated your results? Yes, when I was coaching in the minors with the Padres, my players improved in every offensive category (runs, hits, team batting average, on-base percentage, doubles, home runs) in just one season of me working with them. I’ve also taught my own hitting clients, youth, high school and college players how to execute my hitting philosophy for immediate and consistent success at the plate. Thank you Homer Bush for sharing such great insight. Especially once the metrics get easier to collect and manage with a score-book software, such as Game Changer. The Oakland Athletics recently recruited hitters with swing paths that were optimal for balls down in the zone!!!? Remember guys and gals, knowledge IS NOT power…it’s POTENTIAL power. Please put Homer’s study and research to use. Thank you Homer and Joey for a great interview. Immediately taking away Hitting Zone communication and focus. Can you explain this? I thought I had heard it all and now you are supporting someone who does not think power comes from your core? . Rotating the back hip through the zone is necessary for power. Thanks for your reply and I look forward to next week’s post. I bet you want your hitters to get their tether point (hips) through the zone or else they would never reap any benefits from upper and lower body separation. Jon, what do you mean by through the zone? And are you saying the hips (pelvis) should “get through” to the same point on every single pitch: inside, middle, outside? Upper and lower body separation naturally happens when we walk or run. However, quite a few hitting coaches out there forget about the function of the shoulders, and/or totally disregard their action. This week’s post will clear things up for you Jon, for sure. Shoulders? What’s this you speak off… Next you’ll be talking about armpits and weird muscles around them than perhaps my little forearms…I thought it’s all in the hips ?…. Nice article… Looking forward to your next one. Thanks. By the way Joey… Just because it OUGHT to naturally happen doesn’t mean everyone LETS it happen… Walking is one of those funny things… I’ve been doing it since I can remember… Of course Im doing it right…. Right?